On Wednesdays, North Carolina legislators’ thoughts turn not to pork-barrel spending, but to fried squash in the legislature’s cafeteria. Read about the weekly phenomenon in The News & Observer (Raleigh, N.C.), here. I’ve said it before: Pie is the new cake. And the Charlotte (N.C.) Observer recognizes that fact today with all about pie (although I disagree about salt flavor in the crust – not my thing). The article is here (and in The News & Observer). For those of you who are in terror of making your own crusts, really, it just takes practice. And I find many people willing to eat my pie exercises. At the Winston-Salem (N.C.) Journal, it’s pie time, too, with recipes from winners of an apple pie contest at Historic Bethabara Park, site of the Moravian settlement that predated Old Salem. I notice that none of the three recipes contain my secret ingredient for apple pie filling: A couple of heaping tablespoons of spiced dark rum. Good for the cook, too. The article is here. What parents should feed young athletes is the subject at the Minneapolis Star-Tribune today. Among other things, not sodas and energy drinks – good, old water is great, the experts say. Read more here. The whole “Twilight” thing has now officially gone too far: There is a “Twilight” cookbook. I learned about this from the Salt Lake City Tribune today. The author of “Love at First Bite: The Unofficial ‘Twilight’ Cookbook,” Gina Meyers, posits that the series of books is “brimming with juicy forbidden recipes” and contends Edward is a vegetarian vampire. What, he only bites blood oranges? Read for yourself here. Because Salisbury is the proud home of Cheerwine, the soft drink was a prominent ingredient in numerous dishes at every potluck. A Cheerwine Jell-O mold stands out in my mind. I’m surprised it took this long to marry two of the state’s food products, but it has finally happened: Krispy Kreme doughnuts filled with Cheerwine creme. The specialty doughnuts will be available for the month of July only, according to the Greensboro (N.C.) News & Record, which also writes that a dozen will be delivered ceremonially to North Carolina Gov. Bev Perdue on Wednesday morning. Wonder if she’ll be wearing that hazmat-looking bee suit. The cornucopia in the back seat of my car: blueberries, nectarines, watermelon, cantaloupe, cherry tomatoes, cucumbers and corn. 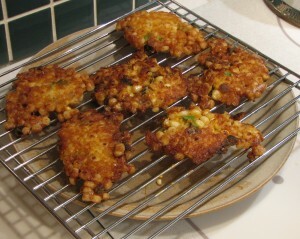 When I got home with it all, I craved corn cakes for lunch. I guess they’re sort of fritters. Sometimes I put chopped shrimp or okra in them, but I had neither on hand. This time it was a couple of ears’ worth of corn kernels, a few shakes of chili powder and smoked paprika, chopped green and yellow onion, a chopped clove of garlic, and salt and pepper. A tablespoon or so each of flour and cornmeal, some baking powder, then a beaten egg to hold it all together. I scooped the batter gently with two large spoons into hot oil and fried the cakes until they were brown on both sides. I drain all my fried foods on a cake cooling rack over a plate, not on paper towels – the oil just hangs around on the towels and gets the food soggy. I made a salad of sliced cherry tomatoes, cucumbers, fresh mozzarella, olive oil and vinegar to go with the corn cakes. That’s a summer lunch. style. He brings the same qualities to his newest cookbook, “Pig: King of the Southern Table” (John Wiley & Sons, &34.95). The book is a classic that I can see dipping into over and over. I tried the Sullivan’s Island Bacon and Shrimp Bog last night, and the clearly written, simple recipe was the perfect mid-week meal. And Villas had the good sense to dedicate the book to my buddy Kathleen Purvis. What more do you need? We know what we should be eating by now, but putting knowledge into action is another matter. Suzanne Havala Hobbs’ On The Table column in The News & Observer (Raleigh, N.C.) talks about new guidelines that may help. It’s here. The new spicy sandwich at Chick-Fil-A contains more than two meals’ worth of sodium, according to this in the Charlotte (N.C.) Observer. Not that I’m a health freak – as you know – but that’s just wrong. Save the salt for something worth it, like an ear of fresh, sweet corn. I enjoy brunch, but I like having it at home. I feel more relaxed than at a restaurant, and the foods aren’t hard to make. I also don’t have to wait until noon to have a little toddy. The Winston-Salem (N.C.) Journal offers tips for preparing brunch at home here. I’ve judged a few cooking contests, and I’ve seen some strange things. But nothing as strange as a chicken salad recipe containing Cool Whip which showed up in the Memphis Commercial Appeal’s contest. Uh, make that FOUR chicken salad recipes with Cool Whip. Good sense prevailed. See the winners (all CW-free) here. Can you hear me now, noisy restaurants? One San Francisco eatery added padded walls to dampen the din – may this be a trend that sweeps the nation. Read more in the San Francisco Chronicle, here. My childhood experience at Girl Scout camp involved grits that solidified into Frisbees and a snake scare in the bathhouse. But Camp Bacon in Michigan, now that’s what I call a camp. For the love of all things bacony, read more at The Washington Post, here. We parked the car and didn’t want to see it ever again. We wanted to see beers, many of them. Luckily, I had planned ahead by asking my colleague in the Association of Food Journalists, Jill Silva, food editor of the Kansas City Star, for restaurant suggestions. One was a mere block away: Blanc Burgers + Bottles. The beer menu was longer than the food menu, which was fine with us. We sampled two local microbrews by Boulevard Brewing, a pale ale and an unfiltered wheat, both smooth and soothing. There are salads and sides, like the delicious onion rings with house-made ketchup and chipotle aioli, but they are but handmaidens to the burgers. The knowledgeable waiter said that all the beef, except that on the American kobe burger, is locally sourced. The brioche buns, large enough to accommodate the half-pound burgers, come from a local bakery. There are bison and turkey burgers, and lentil and portobello burgers, but I had no use for them. The Surf & Turf was tempting – an American kobe burger with lobster tail, lobster butter, fennel and asparagus salad. As was the $100 Burger (actually $15), stuffed with red wine-braised short ribs and topped with foie gras butter and onion marmalade. But my husband went with the Classic: lettuce, tomato, mustard, house-made ketchup and pickles on a sesame brioche bun. On the waiter’s suggestion, I ordered the Inside Out, a burger stuffed with blue cheese and served topped with an onion ring, bacon, ketchup and lettuce on an onion brioche bun. It contained just enough blue cheese to enhance without overpowering the beef; no mean feat. There are times in life when a meal matches exactly what you’re craving, even if you didn’t know you were craving it. And at that time, in that situation, it’s the best thing you ever ate. That’s what happened to us that night. I felt so good that I didn’t even think about smacking our kindly waiter when he looked at the shard or two of burger and bun on my plate and said, “Gee, most people don’t finish that one.” OK, so I was a big honkin’ burger hog, but I was a happy one. I had pointy-head cabbage and little carrots left from the weekly CSA delivery, and a hankering to try to recreate the flavors of a Middle Eastern dish I once ate. Last night, I put them into a casserole that came out pretty good, although it wasn’t quite what I’d had before. In a 9-by-13-inch baking dish: Half of the cabbage, shredded coarsely with a knife (the food processor shredded it too finely); chunks of carrots, a sliced onion, some garlic. Then, about 1 1/2 cups of brown rice and four or five boneless chicken thighs, cut into chunks. I poured over it all about two cans of low-sodium chicken broth and 3/4 of a cup of apple juice. I sprinkled on top a little cinnamon and about a teaspoon of ground sumac berries. Sumac is a Turkish spice that has a fruity sweet-sour flavor. A few squirts of lemon juice and a little more cinnamon would probably make a good substitute. I covered the pan with foil and baked it at 375 degrees for about an hour and 15 minutes, until the rice was cooked and most of the liquid was gone. In retrospect, sauteing the onion and garlic first in olive oil would have brought more flavor to the casserole, but I was in a throw-it-together mood. And the aroma while it baked – mmmm. I love food that smells good AND tastes good. Try it, and let me know what you think. Memories of dads who cook fill The News & Observer (Raleigh, N.C.) today. There are some great stories here of fathers who cook a lot more than mine did. Indoors, he was useless. I remember when my mother had the flu, he had to go to her sickbed to ask her how to heat up a can of tomato soup. But outside, with flame, he was the master. Ribs, whole chickens, burgers, steaks – if it was meat, it was on the grill. And unless it was raining or snowing, it was time to grill. He didn’t make barbecue sauce from scratch, but always “doctored up” the bottled stuff to his liking. Strictly a charcoal man, although he had an electric rotisserie attached to the grill. Smoke is in my blood. A Charlotte dad who’s the star of a cooking video is the Father’s Day story at the Charlotte (N.C.) Observer. He became a stay-at-home dad and learned to make his own baby food, too. Read about him here. People used to say, “huh?” when I told them how much I like Greek yogurt. Now several brands are on supermarket shelves. It’s thicker, creamier and smoother than regular yogurt. The Winston-Salem (N.C.) Journal explores Greek yogurt and offers recipes, including directions for making your own. It’s all here. Bill Daley at the Chicago Tribune rediscovers an overlooked wine – syrah. It’s great with burgers, he says. Read more about it here. We’re having August in June here, and I’d almost fly to New York for one of the grown-up snow cones featured in today’s New York Times. Drool, drool here. This is the first of what will no doubt be a deluge of cookbooks about the garden and Michelle Obama’s efforts to promote healthy eating among the nation’s children. The simple writing and mostly easy recipes in this book make it one that might appeal to older children, and that you could turn them loose in the kitchen with. One recipe grabbed my attention: a radish and green bean salad with apple cider vinegar and garlic. I’m a fan of radishes, and will definitely try that one. The food pundits of The News & Observer (Raleigh, N.C.) and Charlotte (N.C.) Observer have selected the 25 must-eat experiences in North Carolina. Visit here and see if you agree. And if the BLT at Merritt’s Store in Chapel Hill, N.C. had not been on the list, I would be picketing the N&O offices right now. The horrible oil spill in the Gulf of Mexico is expected to increase demand – and prices – for North Carolina seafood, according to the Wilmington (N.C.) Star-News. Read about the issue here. When I visited the Outer Banks a couple of weeks ago, fishermen and restaurants were already talking about the increased prices and availability issues. Goat goes gourmet in the San Francisco Chronicle, which talks about the homely meat’s use in upscale restaurants. There’s a photo of a cut that looks like a rack of lamb. See for yourself here. My idea of “grilling greener” is charcoaling a head of romaine for my salad. Not so in Portland, Ore., where The Oregonian here tells us all how to reduce our carbon footprint while grilling. A solar oven? Ha. I’ll give up my charcoal when the pry my blackened fingers from it.